Objective of visit: To assist with the on-going excavations, mapping and ceramic analysis at Tell Mozan (ancient Urkesh). Fellow visitors: Tell Mozan Project staff and team members directed by Marilyn Kelly-Buccellati (Director) Giorgio Buccellati (Co-director) and Federico Buccellati (Field Director). 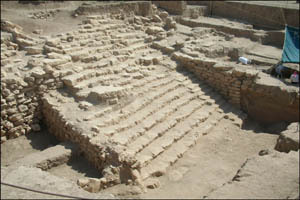 The long-term on-going excavations at Tell Mozan have so far revealed a temple, part of the royal palace, a structure likely used for necromancy and a monumental stairway. My limited involvement in the project entailed the construction of a GIS, mostly aimed at facilitating the establishment of a protected area around the site, and the search for residues of wine in selected potsherds. 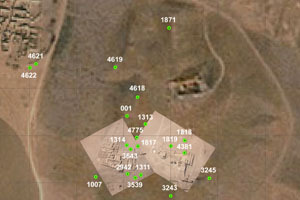 Approximate position and date of the site: Tell Mozan is located near modern al-Qamishly, in Syria, and Mardin, in Turkey. The site was inhabited from approximately 3500-1000 BCE. Short description of the site: Tell Mozan is one of the many city mounds rising above the Eurasian steppes. These are the result of many years of occupation and the large amount of debris and refuse that has accumulated. Upon excavation the site revealed not only mud-brick architecture and many finds, but also rather rare stone structures, including a monumental flight of stairs. The mound is surrounded by scattered ancient remains and has a small modern village near its base. The local climate is continental, with hot summers and cold winters, but also relatively wet springs allowing the cultivation of cereals and cotton. My work in Syria would not have been possible without the Tell Mozan Project and the Cotsen Institute of Archaeology.